What Do the Church Fathers and Popes Say About the Devil? Some Doctors of the Church hold that Lucifer (“bearer of light”), wishing to be at the center of the universe and considering our human nature inferior to his angelic nature, did not accept God’s plan of assuming human nature for himself. Moreover, he did not accept the fact that the woman from whom God would be born as a true man, would be elevated above all creatures, human and angelic, thus becoming the queen of men and angels. Theologians maintain that, in God’s plan, Lucifer, the first angel, committed a sin of pride, rebelling against God. So how was it possible that he could commit a sin, given his perfection? Because God alone is sinless (impeccable), therefore all creatures can sin. If it were possible for a creature not to sin, then that would be a gift from God, not a natural condition. 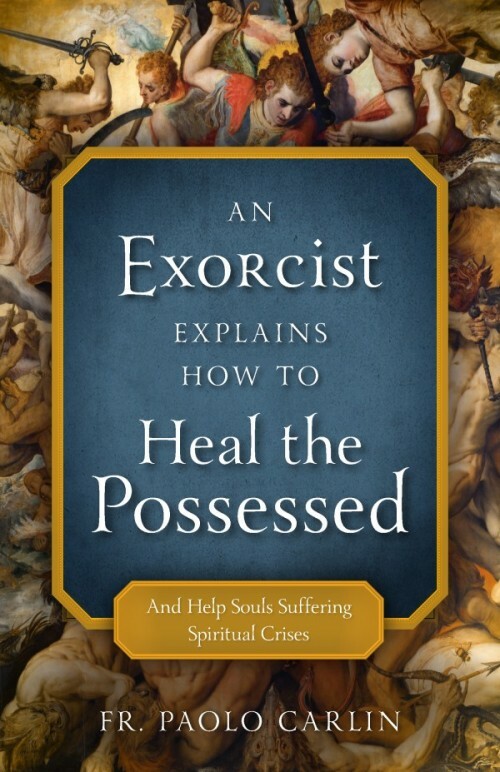 This article is a preview of An Exorcist Explains How to Heal the Possessed. Click image to learn more. The sin of lust: We find this in the book of Enoch, in Origin, and in St. Irenaeus. For Clement of Alexandria, it consists in a sexual union between the decadent angels and the daughters of men. The sin of pride: the desire to be like God and also that the Word assume not a human nature, but an angelic one. The sin of arrogance: the wish to arrive at supernatural perfection solely through one’s own powers. As a result, the fallen angels did not survive the trial of faith that required submission to the will of God. Like every sin, the angels’ sin has personal consequences: above all, they were deprived of the supernatural goal and, therefore, the Beatific Vision. Although their natural intelligence and their natural gifts, in general, remained unchanged, they lost their supernatural knowledge. Therefore, the knowledge of the fallen angels is inferior to that of the good angels. In particular, their knowledge is dark: what they know they cannot relate to God. Moreover, since their choice is definitive, their will remains persistently evil and their sin irreversible for all eternity. Whereas, in relation to God, human liberty is flexible before and after the choice, the angelic will is flexible only before the choice. According to The Shepherd of Hermas, there exists the way of light and the way of darkness. In the Letter of Barnabas appear the terms the Agitator, the Bad One, the Black, and the Lawless. In the Martyrdom of Polycarp (bishop of Smyrna), we find terms such as the Envious and the Jealous. According to Papias of Hierapolis, Satan is the leader of the angels in charge of the movement of the cosmos. For the apologetic Fathers, the demons are not the gods of paganism. Other Fathers affirm that the demons are the children of marriage between the angels and the daughters of men. According to St. Irenaeus of Lyons, Satan was jealous of the first man. For Origen, the gods of the pagans are demons. They have an invisible body, are heterosexual, and require nourishment. Lucifer, their leader, is an apostate and the prince of this world. He and his angels rule men who allow it. Among the Cappadocian Fathers, Basil affirms that the angels were created good, but they became bad. According to Gregory of Nyssa, Satan is an angel who is jealous of man and one day will be conquered. St. Augustine affirms that the angels were created good in view of the harmony of the universe. Those who rebelled against God sinned in the first instant of their creation. But the action of Satan is restrained by Christ. The Devil, the Antichrist, is a king who persecutes the Church. According to St. Augustine, Hell is eternal. Other Fathers and writers are Cassian, who says that each man has a bad angel; Gregory the Great, who affirms that the Christian is in a continuous struggle against the demon; Caesarius of Arles, who describes the works of the devil; and St. Anselm, whose On the Fall of the Devil says that the good angel fell irrevocably of his own accord (propria voluntate), without involvement by God. This is the sin of pride and envy. When Satan sinned, he fell into chaos. St. Bernard’s demonology conforms to what the Bible says. St. Thomas Aquinas in De demonibus, de malo affirms that demons do not have a body and that their sin consists in having desired a supernatural life and glory that is independent of God. Such a sin of arrogance was committed after their creation. They cannot go back, and they cannot know the future, but, through secondary causes — that is, by studying the choices made by men — they can predict the future. Furthermore, their knowledge is not tied to charity. In view of the mandate given by Jesus, the high pontiffs have always spoken of the Church’s struggle against the forces of the Evil One (see Luke 10:9; Mark 16:18; John 12:31–32; Rev. 12:9). In the case of the Devil, evil is not merely an absence of something but an active force — a living, spiritual being who is perverted and perverts others. This is a terrible reality, mysterious and frightening. The refusal to acknowledge the Devil’s existence is a departure from the picture provided by biblical Church teaching. So are the claims that he is a self-sustaining principal who, unlike other creatures, does not owe his origin to God, and that he is a pseudo-reality, a conceptual, fanciful personification of the unknown causes of our misfortunes. The Devil is our number one enemy, our preeminent tempter. We know that this dark, disturbing being exists and that he is still at work with his treacherous cunning; he is the hidden enemy who sows errors and misfortunes in human history. St. John Paul II, in more than one encyclical, also spoke of the Devil, affirming that announcement of the Kingdom of God is always a victory over him. Consequently, building the Kingdom is always exposed to the entrapments of the Evil One. The struggle against evil is the Church’s struggle until the last days of salvation. The pope exhorted us neither to distort nor to deny the power of Satan. With respect to human creatures, demons are angels, personal, powerful spiritual beings who have radically and irrevocably refused God and His Kingdom. Satan seeks to lead man to live with an attitude of competition, insubordination, and opposition to a relationship with God, the Creator. In fact, Satan’s sin consists in refusing God, known to the light of intelligence and revelation as the Infinite Good, subsisting in love and holiness. St. John Paul II points out how this fallen angel, the father of lies, has, to a certain extent, conquered the human realm, and as a result of the sin of man’s progenitors, is the destroyer of supernatural life. The dominance and influence of Satan embraces the entire world. His action consists in tempting men to evil and in influencing their imagination and their superior faculties: their intelligence and their free will, in order to turn them in a direction contrary to God’s law. The introduction to the Rite of Exorcism states that, in certain cases, the Evil Spirit exercises his influence not only on material things, but also on the body of man, which we speak of as diabolical possessions. In this generation, like so many others, people have been led to believe that the devil is a myth, a symbol, an idea, the idea of evil. But the devil exists, and we must fight against him. He is a real presence who acts while hidden even if one is skeptical or only mildly convinced. The devil is a liar, the father of lies; and in order to fight him we must have truth on our side. He is a sower of discord and incites arguments that lead to serious errors. The Devil does not toss flowers at us; rather, in order to kill us, he shoots burning arrows. We need to put on the shield of faith, the helmet of salvation, and the sword of the Spirit that is the Word of God. The Christian life is a battle, a beautiful battle, because when God emerges victorious in every step of our life, this gives us joy and great happiness: the joy that the Lord is the victor within us, with his free gift of salvation. But we are all a bit lazy in this battle and we allow ourselves to get carried away by our passions, by various temptations. That’s because we are sinners, all of us! But do not get discouraged. Have courage and strength because the Lord is with us. From whom do I have to defend myself? What must I do? Paul tells us to put on “God’s full armor,” meaning that God acts as a defense, helping us to resist Satan’s temptations. Is this clear? No spiritual life, no Christian life is possible without putting on God’s armor, which gives us strength and protects us. Editor’s note: This article is an excerpt from a chapter in Fr. Carlin’s An Exorcist Explains How to Heal the Possessed, which is available from Sophia Institute Press. Fr. Paolo Carlin, of the Order of Friars Minor Capuchin, is Doctor of Moral Theology. He was the chaplain of the State Police of the Provinces of Ravenna and Rimini from 2010 to 2014 and was then appointed diocesan exorcist of the diocese of Faenza-Modigliana. Fr. Carlin is a member of the International Exorcist Association (IEA, officially recognized on June 13, 2014 by the Holy See), acting as counselor, official spokesman and press officer.